On the way: Eduardo Cruz takes a breather on the well worn path of the Camino de Santiago de Compostela in Spain. YOUNG Brisbane Catholic Eduardo Cruz can’t get enough of trekking across Spain – it’s a spiritual thing. Since 2013, he’s walked about 1250km and cycled about 470km on the Camino de Santiago de Compostela, a pilgrimage following the way of the apostle St James through Spain. It’s been challenging, at times gruelling and sometimes full of beauty and reward. There have been times when the journey has opened up insights on the meaning of life, faith, purpose and relationships. Above all, it’s been about drawing closer to God and what it means to be a follower of Christ. And Eduardo, a lawyer who is married with a three-year-old son, keeps returning. He’s done the pilgrimage twice with his wife Merinda and this month cycled part of the Camino with a friend. “I know this is my third but there’ll be a fourth and a fifth. It’s going to keep going …,” Eduardo said before leaving Brisbane on December 29 to head for Salamanca to start the Camino on a bike. Each time his experience has been different, full of surprises and part of making sense of a life journey that began in El Salvador. “I was born in El Salvador and we migrated to Australia in 1989 – me, my parents and my sister,” Eduardo said. “I was nine at the time and my sister was six, and like most of the people from El Salvador, we came here as refugees – because of the civil war and all the upheaval that was happening over there. “And most of us in El Salvador are Roman Catholic. It’s something that you really don’t get a choice in – you’re Roman Catholic. Eduardo’s experiences on the Camino have helped him in coming to terms with such differences and with the questions that arise from the reality of evil that forced he and his family from their homeland. He completed his second Camino with Merinda, their son Roque – six months old at the time – and their parents and his sister. “I wanted to do this for Roque,” he said. “I wanted him to feel … Like, he doesn’t know at the moment; he’s only nearly three. I wanted to build a history for us. “I wanted to have that bond with a place that has millions and millions of people (coming from all parts of the world on pilgrimage). “And I wanted him to, when he understands this, to realise that there’s a place where I belong. For Eduardo, this is about what it’s like to be a migrant. “As a migrant it leaves you in a place where … Yes, we’re Australian. I’m as Australian as anyone else but there’s another part of me that is in El Salvador, and I know that I will never spend enough time there,” he said. “And migrants feel … there’s this thing where you think … ‘Yes, we belong here’, but we don’t at times, and sometimes society tells you that you don’t belong. “And I guess what I was trying to do with this second Camino was to create that bond, you know, where that veneer that you call culture, or religion, or whatever you want to call it, drifts away, and you create this bond and no matter what it is, where you come from, doesn’t matter what your history’s like, there’s a common place where you go, ‘Yep, this is it. I belong here’. 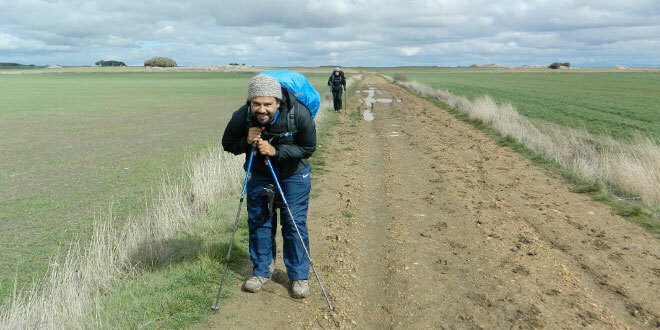 Eduardo said his approach to the Camino each time “has been just to listen and be aware, because your everyday grind may block out whatever the message is that you’re trying to get, or whatever it is that you’re supposed to be doing because when you get stuck into the grind, you may not hear”. He had been struggling and continues to struggle with God over the evil in El Salvador that drove his family and many others to leave and the evil that continues there today. “To date, we have 20 murders a day. For a Roman Catholic country to have 20 murders a day there is an absence of God there somewhere,” he said. “Someone’s not listening. “We had a tragedy that happened to our family in 2011, with a family member, and that shook my faith immensely, and it still does. “And, as I was walking the Camino, I’ve said, ‘Man, seriously, if you’re there you’ve gotta reveal yourself, now. You’ve gotta tell me something, because this is out of control. I can’t handle this’. Eduardo’s Camino experience has helped him. “How did that turn? How did I go, ‘Okay, well, maybe there is a God. Maybe he is listening’,” he said. “As I was thinking about these things, as I was at times symptomising these things as I was crying, as I was thinking about my family, it was therapy, because I was feeling these things slowly drift away. “And you’d walk up. You would get into the next place that you would show up for a bed, and they didn’t know you from a bar of soap and you’d be welcomed. “‘Come in,’ they would say. ‘What do you want? Here you go. Want to take some more? Yep, off you go, take some more food. It’s all good’. “Or you’d walk through places where you would find bottles of water, fruit, biscuits and it would say ‘For the pilgrims’, and you’d take that, and think ‘It’s exactly what I needed’. “God manifests through other people, and people who are in that pilgrimage – whether they’re pilgrims or they’re serving other pilgrims – if they don’t profoundly believe that they are doing something for others then why are they doing it? “That was the manifestation, for me, of God – those little, simple things. “Yes, there is bad in the world. Yes, there is evil in the world. “But there’s a lot of good things that happen as well. And a lot of those good things are faith-driven. “And we miss those little things – those tiny gestures, it’ll be missed because we are consumed by all this (around us), by our everyday. Eduardo became more aware of the beauty in the world and he wanted to hang on to that for Roque and make sure he knew about it. “That’s one of the main reasons for the second Camino and I was driven,” he said. “I don’t want him to be afraid of anything. I don’t want him to just buy into everything that the world tells you. I want him to challenge.